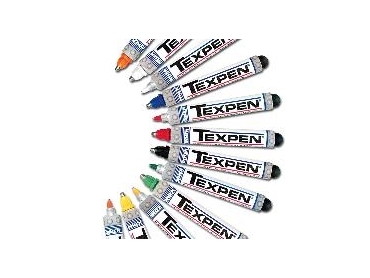 Texpen paint markers, from Australian Warehouse Solutions (AWS), leave sharp, defined, bright marks on any surface including steel, plastic, concrete, rubber and more. The stainless steel-ball valve action tip of the Texpen allows it to write through oil, grease and even underwater. For convenience and useability, the Texpen writes at all angles, including upside down. The paint flow is controlled by the pressure bulb at the end of the barrel. The specially formulated paint of the Texpen does not loose legibility or brightness even in extreme conditions. Ideal for stocktaking of steel, a different colour permanent mark can be applied with each stock take thus allowing easy identification of slow moving material. The Texpen is available in green, blue, black, red, yellow and white from Australian Warehouse Solutions. AWS have been delivering cost effective products to the Australian market for over 30 years.